We asked you to show your colours to win a pair of tickets to Monday's KISS concert at Prospera Place, and we got some great entries. Tara Godwin of Kelowna sent us the winning photo of her son, Jaxon, dressed up as ghoulish band member Gene Simmons. Godwin said the first concert she ever went to was a KISS show back in 1981 and his father's as well in 1976, so Jaxon will carry on the family tradition and even wear his costume to the show. Facepaint, leather and pyrotechnics will explode on stage as rock legends KISS bring their summer tour to Kelowna on Monday. Gene Simmons, Paul Stanley, Eric Singer and Tommy Thayer are the men behind the masks of the "hottest band in the world." For 40 years, the iconic gods of thunder have reigned in the guise of the face-painted demon, starchild, catman and spaceman. They've been a marketer's dream, from Simmons' popular TV show to to Kiss caskets, cruises, condoms and comics, the band's fire-breathing antics are unstoppable. They roll into town in support of their latest CD, "Monster." "The new studio record . . . is a big source of pride for us," said lead guitarist Thayer. "The four of us, we wrote the stuff ourselves, no outside writers. We went in and recorded everything. It was a very organic approach and a very simple approach. We just went in and knocked it out and spent three or four weeks in the studio and recorded this great rock and roll album." 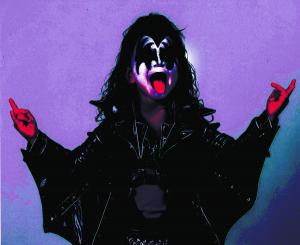 In the 1970s, KISS posters were plastered on teenage boys' bedroom walls, vinyl records with the titles "Destroyer" and "Love Gun" rotated on turntables and "Rock and Roll Over" blared in vintage cars from eight-track players. Fans assembled the Kiss Army, while the band defined how to "rock and roll all night and party every day." "Every night we go out there, we're excited and we want to show fans that this is arguably one of the greatest bands of all time. We love what we do, and KISS has a timeless appeal to it - the imagery, the characters, the makeup, the outfits and the staging. KISS really created live pyro on stage, all the effects and confetti that everybody uses today. It all started with KISS back in the 1970s," said Thayer. "You know, all the shtick." "We have a whole new stage design that's entirely new this year, which over the course of 40 years, tour to tour, you try to keep upping the ante and trying to top the last one," he said. "We call it 'The Spider' stage and the lighting rig and the entire stage has a spider concept to it which is quite extraordinary and it's got a lot of attention and has turned a lot of heads, that's for sure." Thayer, who's been with the band for more than decade, said "it's an honour to be on stage and be a member of KISS. I was a fan way back in the day when the first record came out back in 1974. I've been a fan ever since. It's been a full circle experience." He said some of the band's biggest fans are from Canada. "When we come up there we want to deliver a show that's over the top, that's going to make our fans proud of us." KISS performs with special guests Shinedown. Doors open at 6:30 p.m, show starts at 7:30.